Archifest is an event organized by the Singapore Institute of Architects to celebrate the urban environment and the communities that make it come alive. This architecture festival in meant to engage a wide audience to interact and discuss about the city we live in through the many programmes organized as part of the Archifest. With the theme for 2012 Archifest being “Rethink Singapore”, a team of students from the Singapore University of Technology and Design (SUTD) partook in the organizing of a fringe event for the Archifest2012. In order to imagine a city of the future, old urban moulds must be shed and new definitions made. In line with this idea and theme, the students from SUTD decided to design an interactive set-up aimed at engaging the public and give them the opportunity to rethink Singapore, the way they would want it to be. The fringe event aptly called “Make Your Mark”, it was intended that the general public would contribute their thoughts and ideas in making their mark on the urban development of Singapore. The main idea of this initiative was to provide people with the opportunity to express their creativity in planning a city if given the chance. Visitors were given post-its to write down or sketch their ideas of how they would develop or redevelop parts of Singapore and place it on an enlarged map of the city-island. 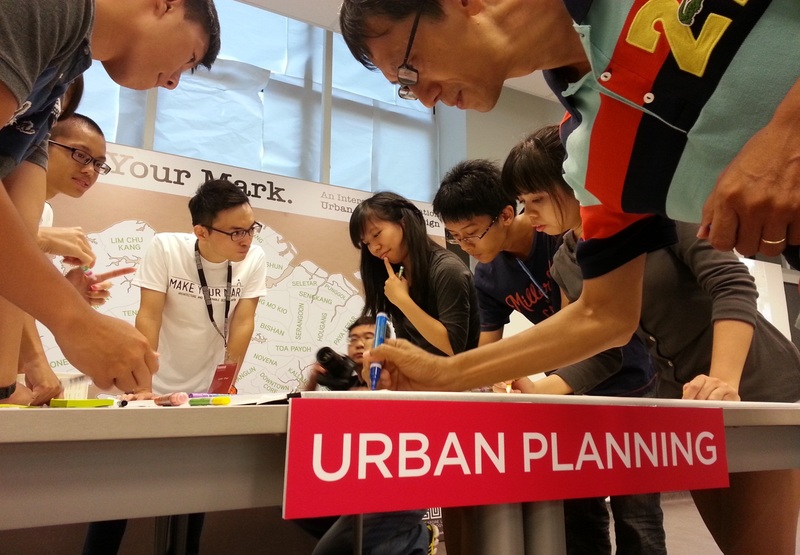 On a smaller scale, the “Make Your Mark” team created an interactive puzzle-like activity to have visitors redesign the streets of Singapore as per they deem suitable. The streets designed for people to plan included that of a main central business district, conservatory areas and also the common residential neighborhood street. Being part of these activities manage to provide awareness as well as allow the public to appreciate the works being done in urban planning of a city like Singapore. Apart from taking part in Archifest2012, Make your Mark transferred into a workshop in 2013 SUTD open house.